The following volume constitutes the second in a series devoted to Buddhist philosophy. It takes up more or less where its predecessor, Volume Seven of this Encyclopedia, leaves off, around the beginning of the second century A.D. This is a period still not well understood, with a great deal of scholarly disagreement remaining about many aspects of the history and thought of the period. The editor of the volume has tried to utilize the most up-to-date scholarship known to us. The volumes on Buddhist philosophy treat the subject altogether chronologically, beginning with the Buddha and ending when Buddhist thought leaves India around 14th century A.D. The purpose behind this approach is to avoid imposing more divisions into Buddhism than are historically apparent. The scope of these volumes is limited to summaries of the texts that are of philosophical interest throughout, theoretical rather than practical in their intended function, and polemical or at least expository in a context where defence of one view among alternatives is appropriate. These criteria have been interpreted here broadly and loosely. In these volumes dealing with Buddhism, the original Sutras, the earliest literature regularly ascribed to the Buddha or his immediate disciples, is not summarized. The entire Encyclopedia has been planned to present as consistent an account as possible of the history of Indian philosophical thought, citing experts on the points that seem debatable. The book image shown is correct, but the information here is totally wrong. 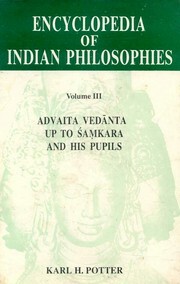 This is not the Volume on Buddhist Philosophy but Advaita Vedanta! The book image shown is correct, but the information here is ..